In 1951 when I was 9, Eva Perón came to our school to plant a tree. I was dazzled by her blonde hair. While I was close enough to observe most of her features, I was too shy and we were much too controlled by our teachers to dare say anything to a woman that my family loathed. At the time we were living in Coghlan on Melián Street. Our neighbours were staunch Peronists. In Argentina we have two independence days. One is on the 25 of May and it represents Argentina’s initial separation from Spain in 1810, when the Argentine born Spaniards, the criollos, refused to accept Napoleon’s brother Joseph as King of Spain. The second date is 9th of July when Argentina formally declared its independence in 1816. In Perón’s time (and 1950- 51 was certainly Peron at his apogee) this resulted in two military desfiles (parades) complete with Sherman tanks and other obsolete equipment. This meant that both Perón and his wife Evita would shout their speeches and our neighbours would play the radio really loud. I remember listening to Perón ( I couldn’t avoid it as I played a lot in the garden) and that his voice would fade and Evita would take over. My grandmother who never really swore in my presence would only say, “Esa mujer,” “That woman.” I never heard my father say anything about Perón (that I can remember). 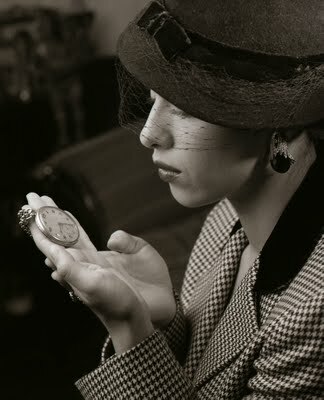 All I knew is that there would be lengthy periods of time when my father was not at home. My mother would say to me, “Your father is at Villa Devoto (the local jail) because he wrote an article about Perón in the Buenos Aires Herald that Perón did not like." The Herald was the English language daily my father worked for. I didn’t know then that my family; on my father’s side were the oligarchy that Evita was attacking. Even today the landed oligarchy, the military and the church are the three most influential powers in Argentina. On my mother’s side my uncle was married to Sarita Lopez Colodrero. Her aunt Raquel held meetings in her house on Avenida Santa Fe for many years in secret plottings for getting rid of Perón. One of the frequent plotters was General Eduardo Leonardi who finally stepped in and instigated the 1955 coup that eventually made Perón escape in a Paraguayan gunboat to exile. Raquel and her relatives all had extensive land holdings in the Province of Corrientes. I remember listening to them on how Evita was expropriating land to then sell and use the money to give to the poor and to build her charity foundations. It was about this time that my grandmother told me that a famous Argentine actress Libertad Lamarque (a strange name that translates to liberty marks her) had to go in exile to Mexico (where she became very famous) because she had called a bleach-blond minor actress a puta (whore). As 9 or 10 year old I really had no opinion on the Perons except that I loathed the wooden toys that Evita gave to all children (including me) on January 6 or día de los reyes (Three Wise Kings Day). When Evita died in July of 1952 that I began to learn some things. The radio stations (including LRA, the government owned station that played classical music) played funeral music. It was when I first heard Chopin’s third movement of his Piano Sonata No. 2. I remember seeing the wake (called a capilla ardiente or flaming chapel by Argentines) and the march (with black horses with tall black plumes) in the propaganda shorts we were subjected to at the movies. And then in the evenings every day for almost a year all radio programs would be interrupted at 20:25 PM and a voice would say, “It is 20:25 the hour when Eva Perón, the spiritual leader of the nation assumed immortality.” Shortly after Perón started tightening his repression of the press and when his masses of descamisados (the shirtless ones) started burning churches, the Catholic Church and the Navy (the real blue bloods of the Argentine armed forces) decided Peron’s time was up. It was then that my grandmother advised my mother that we should leave for Mexico. This we did even though I wanted to stay with my father. I was given no choice (and what did I know I was only 13) we got on a Pan American Grace Airways DC6-B which took us to Santiago, Lima, Panama and Mexico City. I saw the Madonna film version of Evita and I hated it. 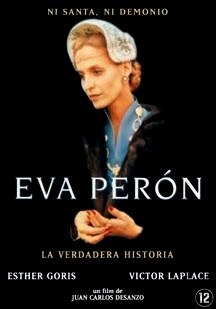 A week ago I found at the Vancouver Public Library in the books in Spanish section the DVD film (1996) Eva Perón directed by Juan Carlos Desanzo. I tried to get my wife and Rebecca interested on Saturday afternoon but after 10 minutes Rebecca complained that the Argentine Spanish was indecipherable and the subtitles just as bad. I turned it off. I turned it on in the evening and saw it alone. I was hit by nostalgia and an appreciation of how good a well made film can be. This is an excellent film. I was hit by a sadness knowing I know nobody in Vancouver I can share the experience of discovering this film that tells the story of a woman who without my knowing had become part of my life. The picture you see here I took some years ago of Argentine model Linda Lorenzo that was in the spirit of the elegant Argentine women I remembered from the 50s. 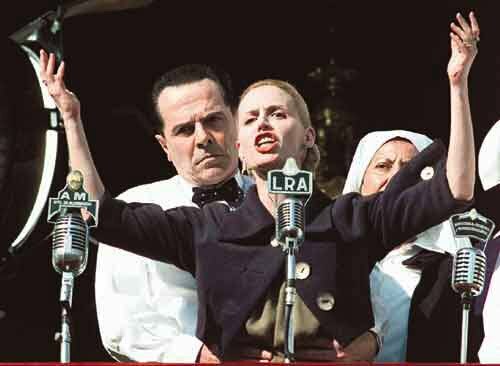 I now notice that there is some Eva Perón in it, too. In the other pictures you see the actors Victor Laplace and Esther Goris who play Perón and Evita in the film. The picture with Perón shows Perón propping up the very sick Evita while her nurse is there just in case. A few months later Evita was dead.